It's December , It's this time of the year again...Christmas time. Oh how I love Christmas time! What warms my heart every Christmas time is I see that everybody is so happy, kids and kids alike too, hehehe. When we were still young, it was even more fun. Aside from the fact that what we all do during the holidays was just play, eat and open gifts, we do have some traditions that we do believe & practiced, even until we were almost in high school. We believe in Santa Claus! And if we will be good boys and girls , we will receive the gift we are wishing for. We hang our our normal socks in our balcony every Christmas eve. Then in the Christmas morning, we rushed to our socks and delighted to see our candy filled socks and underneath it is our gift from Santa Claus. What such joy that fills our hearts every Christmas morning. How does Santa Clause knows what are we wishing for? Well, We write to him, hehehe. We tell him what we have been doing and what we want for Christmas. Sadly, it all ended (the hanging of the socks) when we figured out it was not Santa Claus who was giving us gifts. It was our Papa, Mama and Aunties. How did we figure it out? We did not peek, hehehe. We just found one of our letters to Santa Claus, which they forgot to keep. But it did not break our hearts and it did not stop us in believing that there is Santa Claus. It even made us realize that Santa Claus is within each of us. It is when we SHARE THE JOY to everyone we love during this season as we celebrate the Birth of our Savior, Jesus Christ. So when we had our first baby in the family, I made a special stocking for him to hang (not his socks, hehehe) and continue on with the tradition, and this time it will be us who will pretend to be Santa. 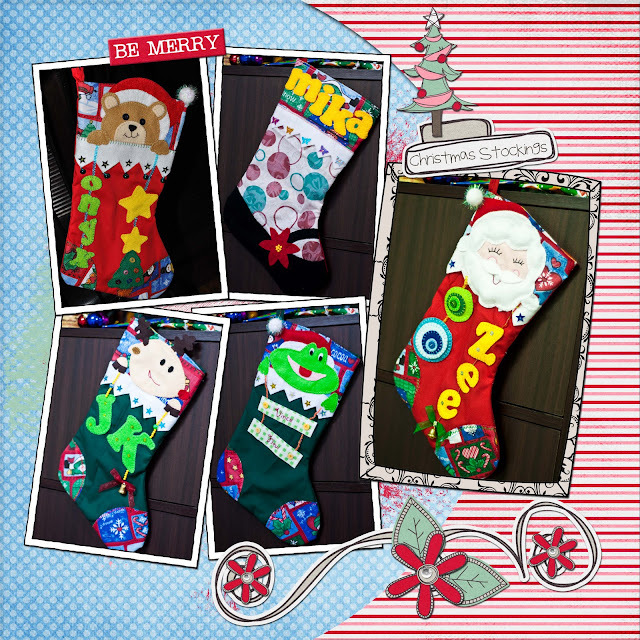 I also made stockings for my friends's kids and the last I did was for my Zee, a very special Santa Stocking. I got my pattern from McCall's. Step by step instructions is also include in the file. You just have to sign up for their e-newsletter, to download all their free patterns. Visit McCall's site HERE. Why not make one for your kid too. You still have time.